Often the answers we seek outside ourselves can only be found within; with practice we can simply release them. 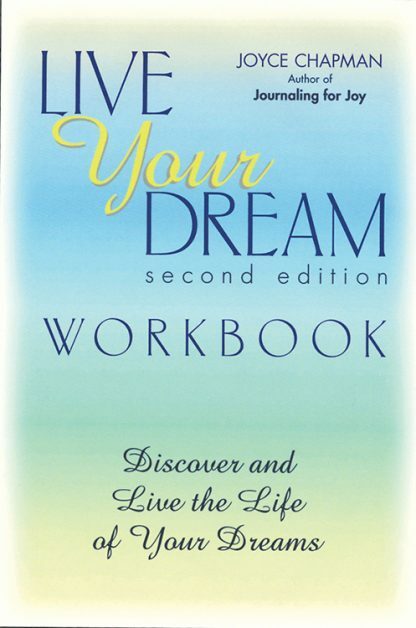 The tips, concepts and journaling exercises in the Live Your Dream Workbook were created by coach Joyce Chapman and have empowered individuals all over the world. The companion manual to Live Your Dream, this step-by-step program dares you to claim and define your biggest dreams. Used together, these books will enrich your experience of discovering your inner self, evoking change and becoming whole. These books may be used alone, with a partner, or study group to make the journey a shared adventure! As you create your dream and express yourself, you will discover practical and personal ways to make room for new dreams in your life, develop a winning attitude, turn handicaps into victories, and stretch and expand your life to its fullest potential.